"London based food art creators Messhead - formed by London Mess Chef James Thomlinson and creative Miss Cakehead, renowned for their macabre flair in the world of food, have come up with a unique burger concept that will push normal levels of taste to it’s very limits. The fearless zombie loving foodies are shuffling headfirst towards the last great taboo - cannibalism - and wickedly fusing it with one of the most iconic snacks on the planet. Their ‘human’ meat burgers are set to delight and horrify in equal measure as hungry punters relish the new dizzyingly devilish taste of eating ‘a fellow human’. The cannibalistic concept was, of course, inspired by the Season 4 finale of Fox’s zombie thriller “The Walking Dead” in which Rick and the group found piles of bloodied bones on the floor at Terminus which looked like human remains – and gives a taster of what ‘Walkers’ from the series enjoy feasting on. On Tuesday 30th September the pop up concept – found in East London - will give away the human burgers for free from midday until sold out. 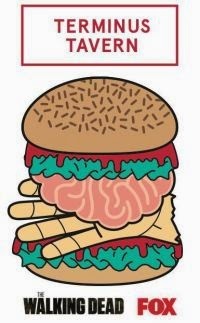 The burgers were developed by Thomlinson using painstaking research into appalling instances when eating a fellow human being was the very last option for survival. One such example was when the 1920’s author and journalist William Seabrook traveled to West Africa and later described the experience of devouring a hunk of homo sapiens meat in his book, Jungle WaysIt was like good, fully developed veal, not young, but not yet beef. It was very definitely like that, and it was not like any other meat I had ever tasted. It was so nearly like good, fully developed veal that I think no person with a palate of ordinary, normal sensitiveness could distinguish it from veal. The burgers will be given away from a custom built stand that recreates the apocalyptic feeling of Terminus where Series 4 ended. 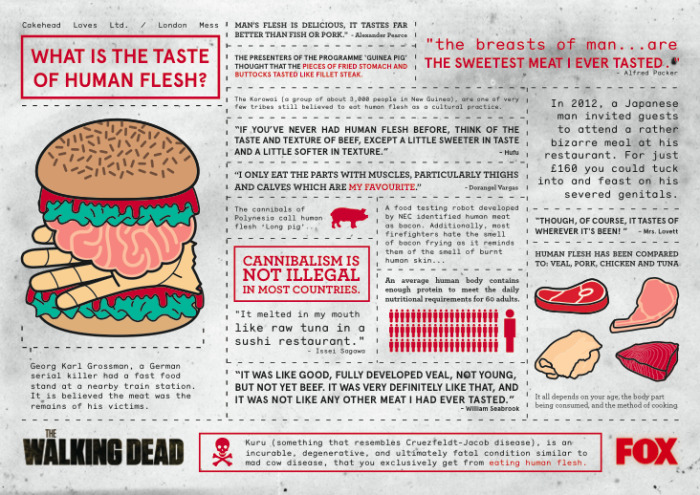 Those brave punters who want to know more about how to create the particular piquancy of person will be able to see the cannibal research in the form of an info graphic which the burgers will come wrapped in. A unique “The Walking Dead” condiment will also be on sale at Terminus Tavern, though best not to ask the source of that sauce! Season 4 of The Walking Dead left us reeling with unanswered questions and cliffhangers. Where is Beth? How will the group escape Terminus? Will Tyreese, Carol and baby Judith find the others? Season 5 premieres on Monday 13th October 9om on FOX and is set to be intense and exhilarating. The story weaves the true motives of the people of Terminus with the hopeful prospect of a cure in Washington. The fate of the group’s lost comrades, as well as new locales, new conflicts, and new obstacles in keeping the group together and staying alive. After all they’ve done, all they’ve sacrificed, lost, and held onto no matter what the cost...Who do they become?"